Want a way to promote your books without spending a penny on marketing? 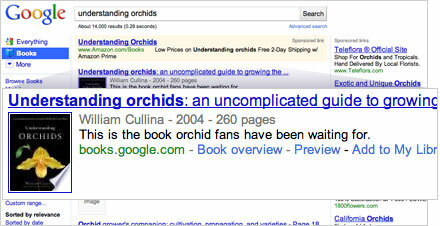 Google Books allows publishers and authors to submit their books for inclusion in Google’s search results. Sign up for Google Books today! Once you send Google your titles (or upload them as PDF files), we'll add them to our index for free. By matching the content in your books with user searches, Google Books connects your books with the users who are most interested in buying them. Each Google Books result will display the book’s title and author, a short excerpt containing the highlighted search terms, and other public data about the book. Clicking on your book from a search results page takes users to a limited preview of your title – just enough to give them a taste of the book, as if they were browsing in a bookstore or library. 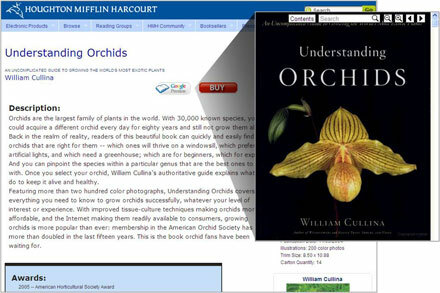 Links to bookstores and online retailers make it easy for users to go from browsing to buying. If you sell your books directly from your own website, your site receives “top billing,” appearing first in the list of purchase links. 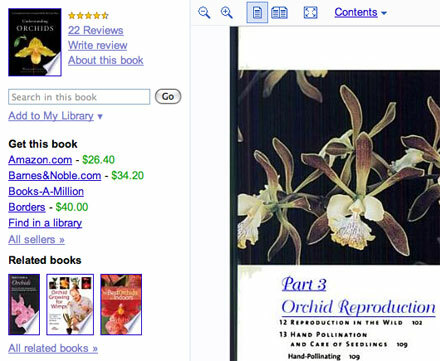 Google Books previews also appear on book-related sites like online retailers and social book networks. Users get a taste of your book—but only a taste. We scan the full text of your book because we want people to be able to search all its content. But users can only access a limited number of pages to determine whether they've found what they're looking for. We understand that your books are valuable, so we treat them with special care. All the books you send us will be hosted on Google servers and protected by the same security as Google.com’s search data. To further protect your book content, printing and image copying functions are disabled on all Google Books pages. As a Google Books partner, you have access to Google Preview - code that allows you to embed previews of your books right on your website. With Google Preview, you can easily enhance your site, for free. Visitors to your site can browse and search within your books right on each book’s product page. Of course you’ll want to track how you’re doing—and you can. Online reports let you manage your account information, view how many consumers have looked at your titles, see click rates on purchase links, and review other stats related to the Google Books program. You can customize reports to view results by date, title or ISBN. Ready to give Google Books a try? Simply sign up online, then upload or send us your books. You've got nothing to lose, and a planet's worth of new readers to gain.